The first survey of public views towards the government’s newly agreed Brexit position, conducted by Survation on Saturday 7th July 2018 – after the details of the Chequers agreement had emerged but before the resignation of the Brexit secretary David Davis – has uncovered a dearth of support for Theresa May as she enters one of the most critical episodes of her premiership. 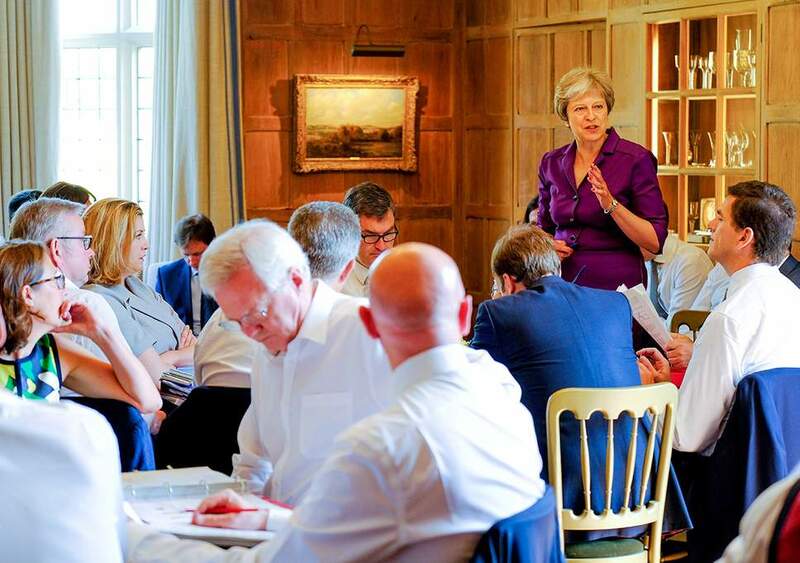 As chatter grows about a possible leadership challenge to Mrs May in light of Davis’ resignation, the questions we posed on the prime minister’s own future have taken on even greater salience. 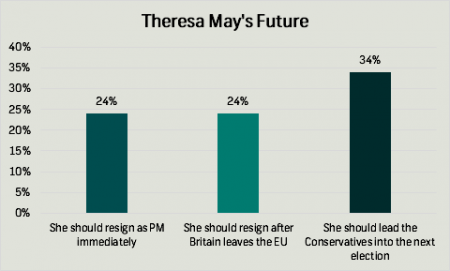 Among those we surveyed on Saturday, 24 percent thought May should resign immediately and a further 24 percent thought she should hand over the keys to 10 Downing Street to someone else after Britain leaves the EU. Just one in three (34 percent) backed her to lead the Conservatives into the next general election, scheduled for 2022. Our respondents were not convinced that May stepping down would have much effect on the outcome of the Brexit negotiations, as 29 percent thought the UK would get a better deal with someone new in charge, 20 percent thought the country would get a worse deal and 32 percent thought it would make no difference. 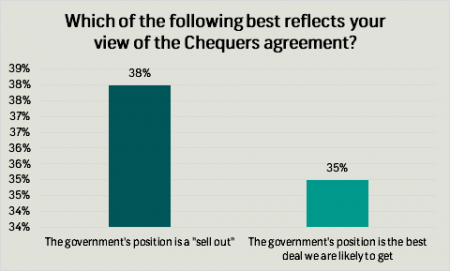 There was a similar lack of consensus in attitudes towards the substance of the Chequers agreement, with 38 percent calling the government’s position a “sell out” against 35 percent who thought it constituted the best Brexit deal the country is likely to get. 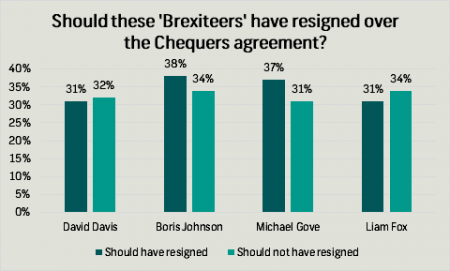 With fieldwork completed the day before David Davis resigned over the Chequers agreement, we asked respondents whether four key ‘Brexiteers’ should quit the government: while respondents were near equally divided on whether Davis should have stayed put (should have resigned 31 percent, should not have resigned 32 percent), more people thought Boris Johnson (should resign 38 percent, should not resign 34 percent) and Michael Gove (37 percent to 31 percent) should have left their posts instead of supporting the cabinet’s stance. When asked why the foreign secretary had seemingly reversed the opposition to the proposed agreement he had expressed in the run-up to the Chequers summit, 62 percent thought his actions were likely inspired by fear for his job, while 18 percent believed that he had come to the honest view that the prime minister was right. 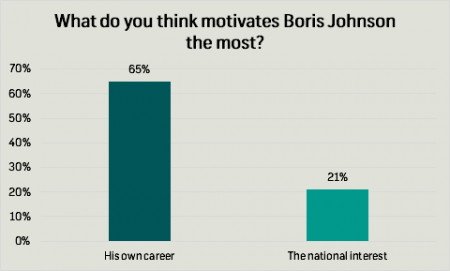 This finding chimed with the broader public view of Johnson’s motivations, as two thirds (65 percent) said they thought he prioritises his own career prospects over the national interest, against 21 percent who thought the inverse was true. It remains to be seen how this weekend’s events will impact the party’s standing in the polls, but our results show Labour regaining a narrow lead even before the fallout from the Chequers summit. 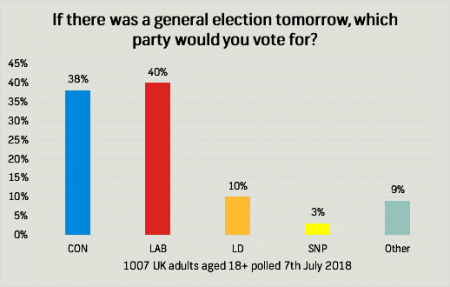 Labour now sits on 40 percent, up two points since last month, while the Conservatives are down three to 38 percent, giving Labour a lead of two points. The Liberal Democrats have risen to 10 percent, up from seven percent in June. Research was conducted online with a sample of 1007 UK adults aged 18+ on behalf of the Mail on Sunday. Fieldwork 7th July 2018. Full results can be found here.